Are You on Track with Your New Year’s Lawn Resolution? Springtime in the Atlanta region means it’s time to concentrate on lawn care and gardening once again. You may have been planning ahead, envisioning a beautiful, healthy green yard, and even made a New Year’s resolution to focus on your lawn care. Here are some easy steps to creating the perfect lawn and keeping it that way throughout the growing season. Sandy clay soils are prominent across Georgia and are mostly acid-based. If you’re not familiar with the type of soil in your yard and have never had it tested, you should, especially if you’re planning on laying down new sod at some point. 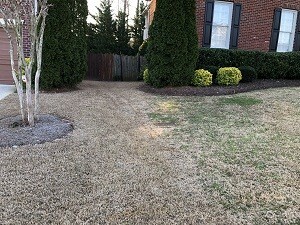 Professional lawn care services in the Atlanta area are likely familiar with the type of soil in your area and they can perform any soil quality testing if needed. Placing sod on hard, infertile soil will not promote its growth. Experts say it is best to add about 4 inches of topsoil to the hardened ground, then till it into the hardened soil before laying down new sod. Experts also suggest not to apply any urea fertilizer to your soil until it reaches about 65 degrees at a 4-inch depth. Early March soil temperatures hover around 60 degrees in the Atlanta area. Not only would the effects of the fertilizer be lost in soil that is too cold, the fertilizer could stimulate growth too early in the season in certain areas of your yard. Step back and take a look at your yard. Which areas are shady and which receive full sunlight? 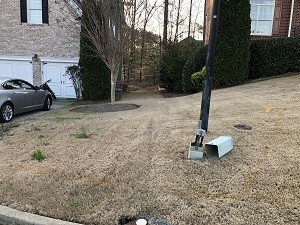 The most prominent lawn grasses in the Atlanta area are common bermudagrass, which works better in sunny areas, and fescue, which tolerates shade better than some other common grasses. However, some bermudagrasses do tolerate light shade, meaning they can thrive in 6 hours of sunshine filtered through trees or foliage or 6 hours of unfiltered shade between sunrise and sunset. TifTuf bermudagrass was developed at the University of Georgia and released in 2016, but was in testing as far back as 1993. TifTuf bermudagrass maintains its green color when others lose it during periods of drought. It uses less water to stay green, and it doesn’t go dormant during periods of drought-stress like other grasses. Mowing your grass to the recommended height and fertilizing according to soil temperatures and type of soil are just two of the ways to keep your lawn looking beautiful. Professional lawncare in Atlanta can make a significant difference in your yard’s health and appearance. Aeration, weed control, disease prevention, and soil diagnostics are all beneficial services provided by experienced landscaping and lawn care specialists. For more information on our selection of lawn care services, please visit our website.